"My Divine Avataric Self-Revelation-Word Became a completely different kind of Utterance. Most essentially, My Divine Avataric Self-Revelation-Word has Become The Aletheon." This final and greatest Instruction by Avatar Adi Da spans over 2300 pages. 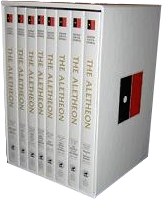 The Aletheon eight-volume edition, recommended for ease of study, includes an attractive slipcover. During the final two years of a Lifetime that had been utterly devoted to the Communication of Truth, Avatar Adi Da created His supreme Scripture—a book of oceanic depth and magnitude. Day after day, month after month, Avatar Adi Da sustained a vast flow of spontaneous writing—moved by His indefatigable Impulse to "say everything" to everyone. In keeping with the unique and profound purpose of this final book, Avatar Adi Da eventually chose to name it The Aletheon (pronounced “a-LAY-thee-on”). The title was His own coinage, based on the ancient Greek word for "Truth"—"Aletheia". Thus, this last and greatest book by Avatar Adi Da is, simply, "the Truth Book". The early years of Avatar Adi Da's active Teaching-Work had been an astounding demonstration of His willingness to Submit Himself to ordinary egos, and to Work by reflecting egos to themselves. However, in His final Teaching-gesture of writing The Aletheon, Avatar Adi Da had utterly relinquished His previous mode of Self-Submission, and made only His own purest Communication of Truth. Such is the unique quality and purity of this greatest of His Teaching Gifts. The Divine Avatar's work on The Aletheon ended on the very day of His Passing. 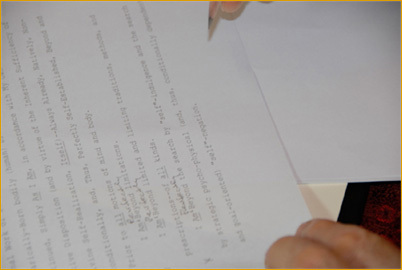 On November 19, 2008, He said that He felt His writing of The Aletheon had come to completion. After that, He never again raised a pencil to write more for the book—except on the morning of November 27, when He called for the title page of The Aletheon and finalized the wording on that page, thereby forever bringing to a close His final great writing-labor of love. Reading The Aletheon in its entirety is pure ego-dissolving intimacy with Bhagavan Adi Da Samraj. I distinctly felt how immersion in this Text is direct Communion with Him, in His Room. Each day of study was an ordeal and ecstasy of conformity to His Pattern—He simply Requires the subordination of the “I”-“other” paradigm, I couldn’t bring “me” into the conversation! And I discovered how depthful participation in His Aletheon-Transmission actually prepared the nervous system to fully receive the Divine Self-Confession of Reality Itself, Appearing as Bhagavan Adi Da. The Aletheon is also available in the Single Hardbound Edition and the Special Limited Edition. To learn more about this supreme Scripture, visit the article, ”The Aletheon - an introduction”. For our U.S. customers: When choosing “Shipping Method” in the checkout screen, we recommend UPS Ground for better handling and their included $100 insurance. However, depending on your location, US Media Mail is often less expensive. For our non-U.S. customers: USPS Priority International (over 4lbs) is the only choice.